The top is final sanded before it is braced up. The photo here is of a maple back but the concept is the same. The first step in the bracing is to prepare the X braces. After cutting the quartersawn stock to the correct dimension (in my case 5/16 wide by 5/8 tall) I cut the slots for the X joint. 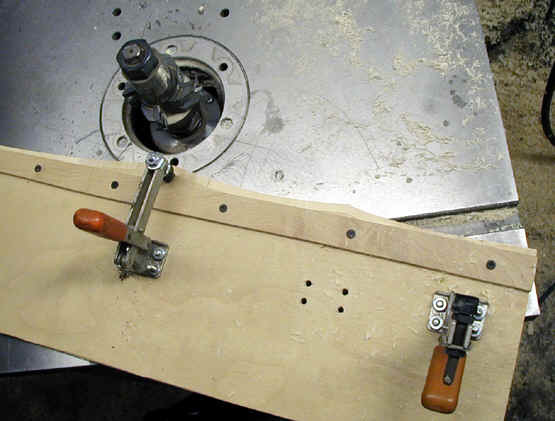 I do this with a simple jig that holds the braces and guides a router to cut the slots. 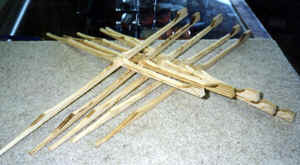 This photo shows the underside of the jig and the clamps which are used to hold the braces. If you count you will see 5 pieces of wood. 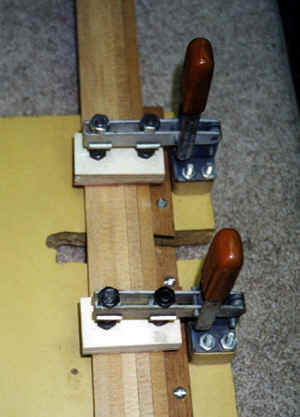 The last one is a sacrificial piece to prevent the router from chipping out the edge of the brace. 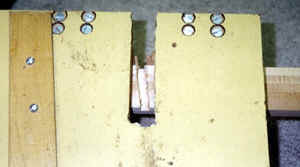 This photo shows the top of the jig (it is bolted to a workbench when in use). 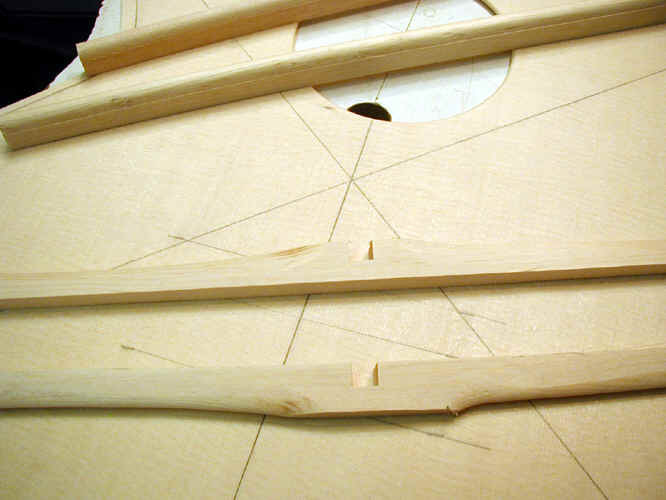 The operative part is the piece of maple on the left side of the photo. This is mounted at the correct angle to produce the angle I like for my X braces, and is the guide for the router. 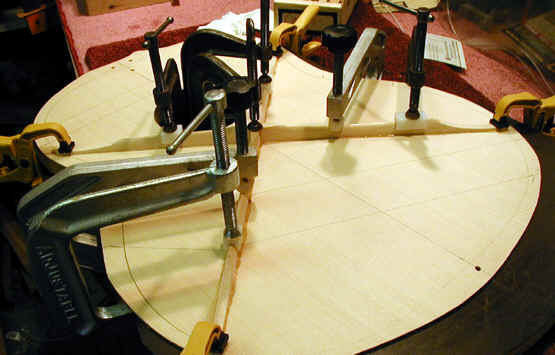 When making this jig I established the location of this piece by pure trial and error. I am content to leave it at this angle for all of my guitars. 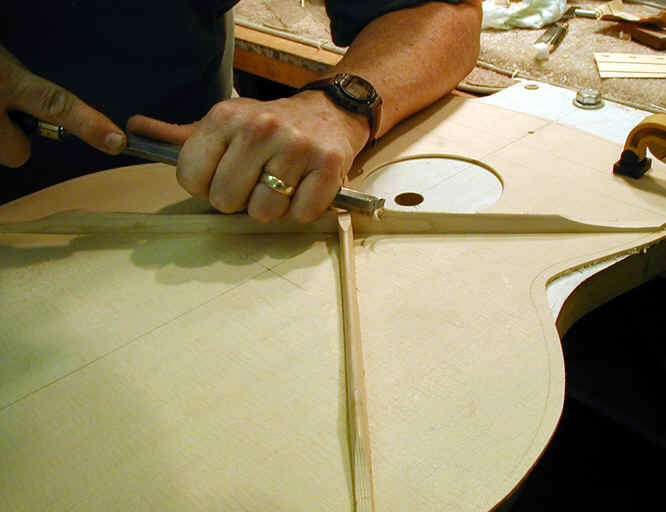 I believe -- without any scientific evidence -- that the included angle of the X brace is one of the important elements in determining the sound of a makers guitars, and feel that this leads to at least part of the "signature sound" of my guitars. Just a pile of completed X braces. 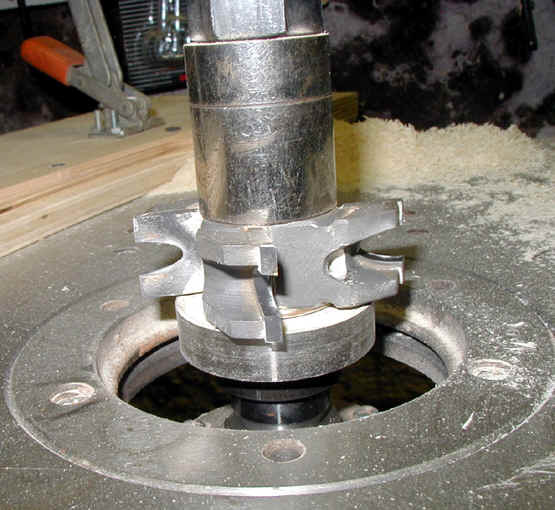 After the X joint is machined I do a rough shaping of the brace on my spindle shaper. 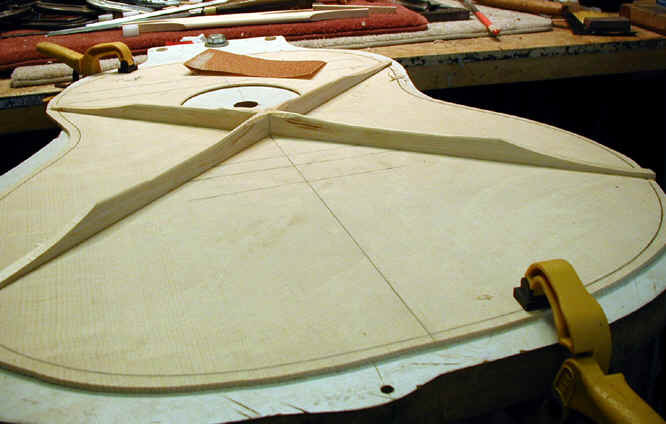 This is not intended to be the final shape, but does reduce the time and effort in the hand carving which takes place after the braces are glued to the top. Closer view of the notch and some of the shaping on the X brace. Another view of the rough brace. 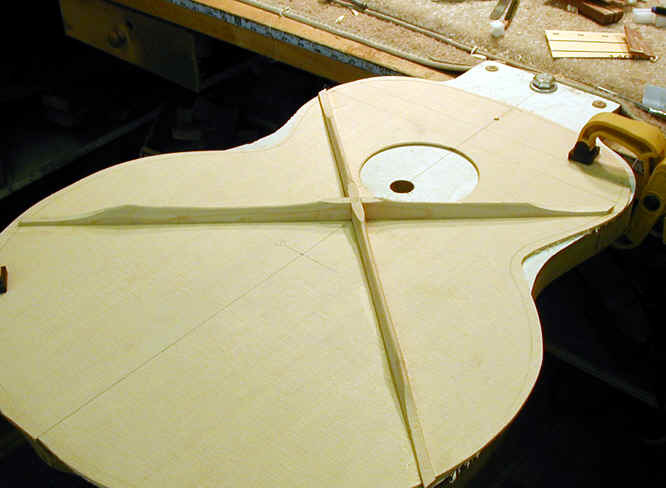 At this point this is all machine work - the hand shaping to refine the shape (and hopefully the sound) comes after the braces are glued to the top. This is the cutter for my spindle shaper which I use to rough out many of my braces. This jig holds the brace - the ball bearing under the cutter follows the front edge of the jig and cuts the brace in the scalloped shape I want. 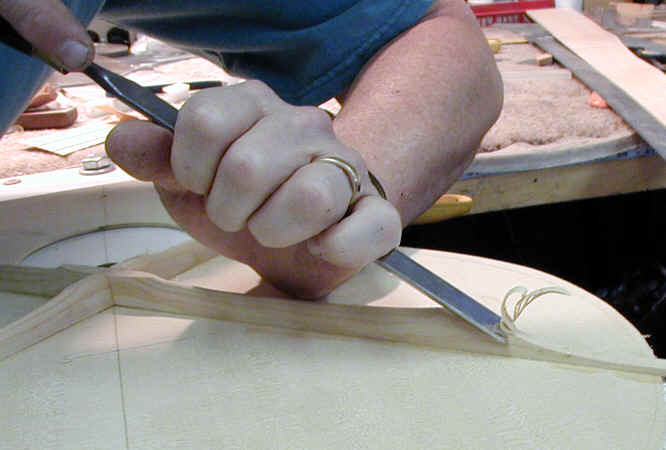 Here I am gluing the X brace on one of the harp guitars. Because this is a very unusual project, the braces are installed before any carving is done, and I will carve these to shape after the glue is dry. 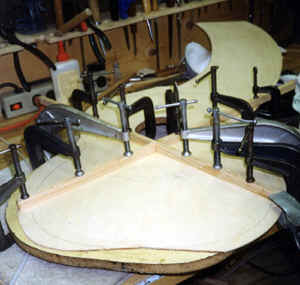 Several years ago I started using hot hide glue to put together the top, including all the top braces. Of course this is the method used "in olden days" and there is some reason to believe this may have a positive effect on the sound, and will have no negative effects on the durability of the guitar. Similar step on a regular top. 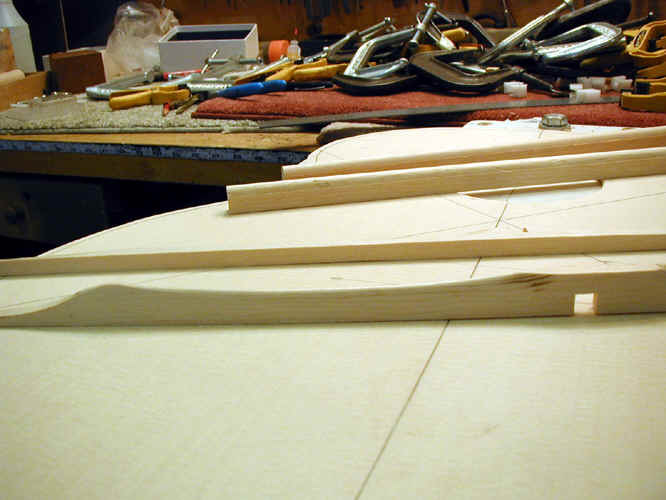 As you can see, the X brace is partly shaped before gluing. I do this on my spindle shaper. 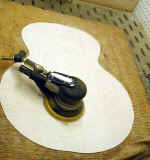 This is really a time saver rather than final shaping, since I do some carving after the braces are glued in place. Although the photo doesn't show it well, there is a Plexiglas caul over the intersection of the X brace which has channels cut that hold the X in exactly the right shape. While I cannot prove it empirically, it is my opinion that the angle of the X and its location on the top have a great deal to do with the sound of the guitar. As a result, in order to maintain my "signature sound", I control this element very carefully. 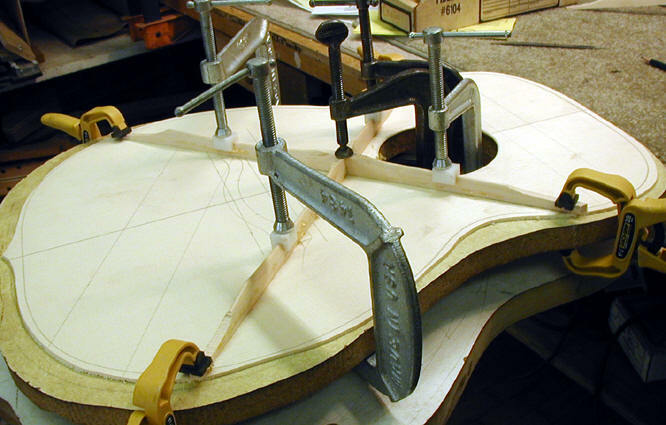 The X brace is glued in place and roughly shaped. This brace is now ready for carving. As noted above I have been using hot hide glue for several years - I am convinced that it does help the sound of my guitars. Some final shaping of the braces, which will be followed by sanding to a 220 grit.